With the vast distances that separate settlements in the Far West, the Chartered Houses of the Empire cannot lay rail fast enough to serve their needs – rail lines are easy enough to build in more civilized areas (The Empire proper, The Periphery, even the eastern portions of the Far West itself), but to lay rail across the untracked frontier requires far more than just material – it requires security, and more than that, it requires volume. Bluntly, most of the far-flung settlements of the Far West are not yet large enough to merit the expense of building rail out to them. They simply do not have enough cargo or passengers needing to go there. But those settlements do need cargo, and passengers do need to travel, even if not in the numbers that merit action from the Chartered Houses. It is from this need that airships first arose. Able to travel across any terrain, at speeds roughly comparable (if a bit slower) than a steam train, airships quickly proliferated to feel the demand. 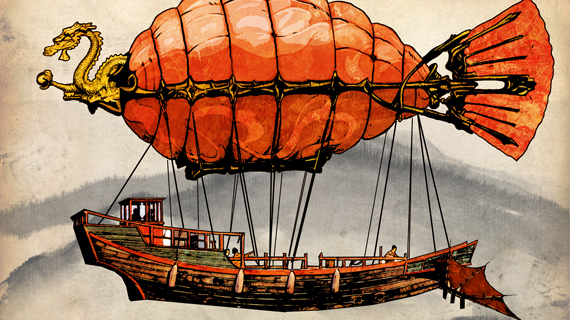 There are two varieties of airship in the Far West: Buoyant and Furious. Buoyant airships use bags of lighter-than-air gasses to achieve lift. A vessel of some sort is borne aloft by being hung below the gas bag. Forward propulsion is handled by a variety of methods, depending on the individual vessel – some use sails, some use rotors, some even use rockets. Furious airships are another matter entirely. Much rarer, and much more advanced, these airships have at their heart a Fury Engine, an invention of the famed Iron Circle. A Fury Engine draws the positive and negative furies – the energy flux that permeates all matter in the universe – from the air surrounding the engine, and places those furies into a containment vessel. The furies, being polar opposites, come into conflict. This conflict exponentially increases until it draws all of the energy potential of the furies – leaving no remaining energy to exert upon the engine. As such, the physical laws of the world, governed by the interplay of those positive and negative furies, fail to come into play. The law with the most direct effect on airships fitted with a fury engine, the law of gravity, no longer applies. Airships built with a fury engine derive forward propulsion from the same methods as Buoyant airships – but some also use bled-off energy from the engine itself, directed via baffles to “push” the vessel (although the current state of design has yet to figure out a way to do this at a speed comparable to other methods – without tearing the vessel apart, at least). Airships operated by entrepreneur captains began to reach out into the Far West, carrying passengers and (more commonly) cargo. Naturally, the existence of cargo moving through the air of the Far West led to another development: Pirates. Outlaws who use airships of their own to sack and steal. This led to more and more airships being armed… for defense (and, more often than not, offense). From there, it was a short step to armed airships being used in the Secession Wars. Thank goodness I pledged cause airships are awesome! Agreed! A character idea, greatly influenced by Lee Scoresby (Golden Compass) and Harry Mudd (Star Trek) is beginning to form…out-of-luck smuggler/snake oil salesman who always has another con up his sleeve and narrowly escapes via his tattered balloon. Im still tryig to figure out how to incorporate the idea of a old tailor who specializes in sewing secret pockets into garments and also sews secret messages into is stitchwork.